We're Kelsey McGlashan's family - Kelsey is one of the students in Sarah's class in Ripton, and he showed us your site and your responses to theirquestions! How totally fun - and thanks so much for doing this. He is very excited about this - he really likes geography and science, so your work isright up there for him. Kelsey says you have a picture and a question from him already and know who he is. We have a few quick questions, then we have to dash to swimming lessons tonight. First, is there a woman who works there from Missoula Montana? If so, she is probably the really close friend of a really close friend of ours. I am trying to get her name. Second, how long are you there for and for what purpose? We are so curious about the whole thing. And where were you and what were you doing before this, that got you there (my question)? Looking forward to your response, sorry its so brief, we're late! Bye, Kelsey, Cody (his brother) and Amy (mom). Its amazing how many people know someone who is down here. Considering there are under 1,000 people living at McMurdo Station this is proof that we really do live in a small world. I actually know quite a few people who live in Missoula. Let me know if you are able to get your friends name and I will be sure to say hello for you. So why are we all down here anyway? The United States Antarctic program is operated under the guidance of the National Science Foundation. Within this group there are many subcontractors who actually provide the support services need for the researchers. I work for Raytheon Polar Services Company. This year I am working with the Fuels Department and we are responsible for keeping everything moving and everyone warm. As this site grows I hope to add a section that explains the various aspects of my daily work here. In short we refuel cargo airplanes and helicopters that fly to the deep field camp, South Pole Station, and to New Zealand, which connects us to the rest of the world. Each of our summer field camps relies on diesel generators for power and heat. At the beginning of each season someone from my department will go out to these remote locations to set up the fuel systems, enabling the camps to operate. Come February we are very busy with the annual off load of our re-supply tanker. Most of us take for granted the many comforts and conveniences we all share at home. Working here has given me the opportunity to see first hand how much effort is involved in keeping a community functioning. Antarctica certainly is not a common destination; let alone a home or office for most. Before coming down here three years ago I had been working as a guide for Trek America and for Broadreach. With these companies and through my own personal travels I have been fortunate enough to have explored many reigns of our world. After a trip through Africa in 1997 I had only one continent left to visit. A few years prior to this while on a five-day canoe trip in the Nancy Lakes State Recreation Area of Alaska I meet a Navy helicopter pilot. As we paddled along he told me many stories of his adventures while stationed in Antarctica. There has never been a military base here but the US Navy was instrumental in establishing the American research stations during the late 50s through Operation Deep Freeze. The Navy has since handed over the support role to civilian contractors. For five and a half months of the year I call Antarctica home. Its a lot of hard work, often in very harsh conditions but the rewards are amazing. Once the end of February comes along I will head north to the sun and warmth to defrost. I have not yet made plans for the next chapter of my life but fortunately I have some time to think about it. My name is Sean H. and I live in Ripton, VT. I am nine years old and I like to play soccer and tag. Here are a few questions I have for you. 1.How cold is it in winter? 2.How do you get to places? 3.Do you have a picture of the cool cars? 4.Do you have cool rocks there? Bye! Sean H.
Wintertime here can get very cold. 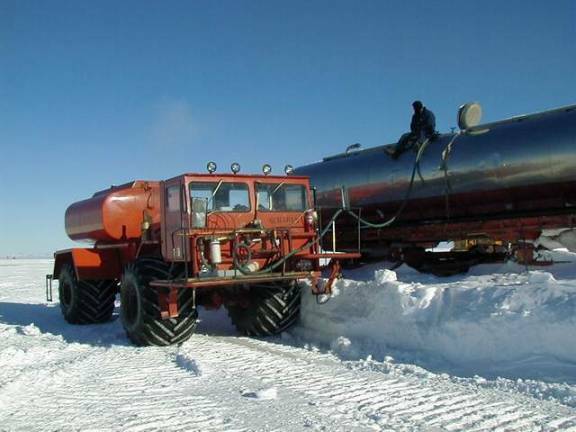 The coldest recorded temperature in McMurdo was 59F. The South Pole Station gets even colder. Its record low was 113F. The coldest place ever recorded on the planet occurred in Antarctica at the Vostock Station where it reached 129F. Fortunately for us it is not always this cold. During the summer months we actually get into the positive numbers. McMurdo is generally in the 20s and our record high reached a tropical 49F. This was very unusual. The record South Pole heat wave just barely got in to the positive, toping out at 5F. We do have a lot of strange looking vehicles here. They had to be specially designed, as we have no roads. I have pictures of them in my photo album section listed under Ice Vehicles. Many of the camps are quite far from McMurdo Station. To reach these areas we rely on air travel. You can see some pictures of the airplanes and helicopters we use here in Antarctica on the page titled Air Travel. We definitely have a lot of cool rocks here. Miss. Carpenter has shown you the Erebus Crystal I brought back for her last year. That was found near the top of Mt Erebus, which is the southern most active volcano in the world. Most of the rocks are buried under the snow and ice, which is sometime up to 3 miles thick. Scientists have drilled through the ice to get samples of the rock below in hopes of learning more about the history of Antarctica and our planet. 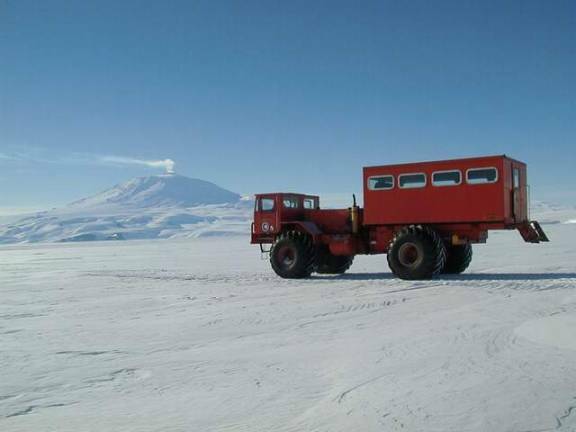 Here is a picture of Mt Erebus where the crystal came from and one of our trucks driving on the frozen ocean. The rocks that we find today can tell us a lot about the past of Antarctica. Currently, the continent is covered in ice and snow. From the rocks we are able to learn that this was not always the case. Here are a couple of pictures of some unique rocks that help us understand Antarcticas past. I tried to put together a collection representing the many different classifications of rocks. 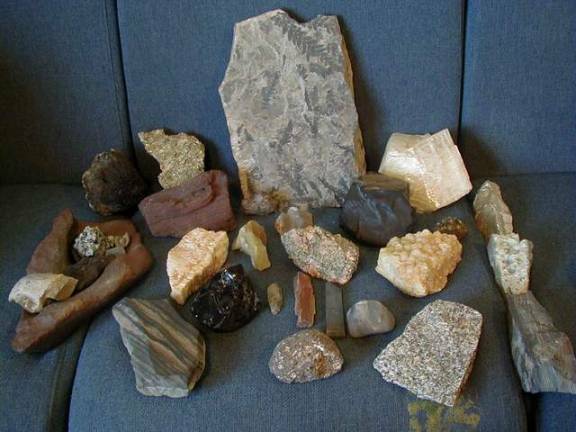 With a bit of help Ill bet you will be able to identify the 3 major groups: igneous, metamorphic, and sedimentary. I find all of these rocks to be very interesting particularly as they tell a great story. The one on the left contains fossils of Dicroidium and Sphenobaiero. 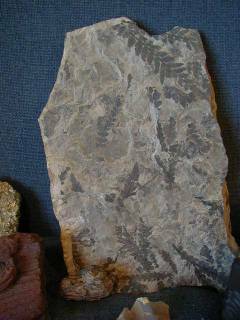 These were ferns that grew during the Triassic Period about 220 million years ago. In the above picture can you find the piece of petrified wood? Looking around here today you would never guess that trees, plants, and animals could have ever lived in Antarctica. With the discovery of these rocks scientists are able to look back in time and unlock the mysteries of Antarcticas past.